I also agree with the above reviews, however, I still rate Interstellar very highly. 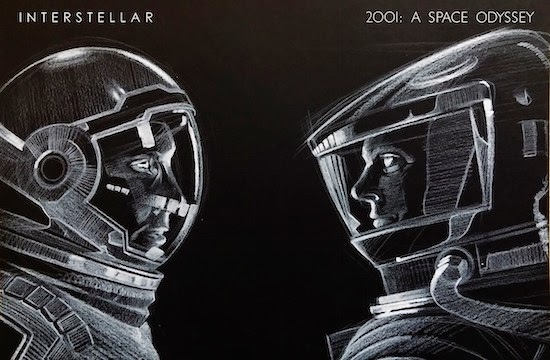 Nothing comes close to the masterpiece of Kubrick’s 2001:aso, of course, and Interstellar is no masterpiece, but as sci-fi movies go it is in my top favorites. Unfortunately there is a lot of unnecessary and pointless stuff in this 3hr movie, which is well covered in the above reviews. These I can forgive and forget, however the only part i really have a problem with is wtf was all that clichéd bs with Matt Damon supposed to achieve. I can only hope that when the Nolan brothers evolve to hyper-dimensional beings one day that they communicate with their human proto selves to cut that entire sequence (sorry Matt). I don’t like movie bashing but reasonable critiquing is necessary and constructive to encourage movie makers to spend the time to get intelligent about their plot points, otherwise they will continue to allow weak elements to be rushed through within the time constraints imposed by Hollywood to make a deadline. That’s why any movie that comes from Hollywood these days I never go to see with any high expectations particularly when dealing with cosmic meaningfulness and human destiny. It seems if you want to make a movie masterpiece (or even just “the proverbial good science fiction movie”..) then you have to follow Kubrick’s example and cut your ties with Hollywood in order to spend the time perfecting your vision without constraint (that’s if money is no problem). Hollywood is where the money is, I guess, and all the resources. Unfortunately, the bottom line is that making a movie is a business and the movie must make money! So can an intelligent movie make money at the box-office or become a block-buster without all the over-the-top, action-adventure, love-story, tear-jerking, clichéd, formulated plot elements being added in the mix in some awkward side plot? I have seen some brilliant movies that seem to be the exception, but unfortunately they are the exception, not the rule. Having said all that, there are a lot of brilliant and intelligent elements in Interstellar that I loudly applaud and encourage anyone who likes sci-fi to definitely go see it. Excellent and thorough analysis, David. Thanks for posting it here! Non ho ancora visto Interstellar, ma non ho mai apprezzato i film di Nolan. A me sembra un regista hollywoodiano di stampo classico che ha imparato ad utilizzare strutture narrative non tradizionali. Poco altro. Sarò senz'altro io, ma non riesco a capire cosa dovrebbero avere di speciale i suoi Batman rispetto agli altri film di supereroi. Comunque sia, va visto, anzi rivisto! Vero anche quello che dici tu. In settimana vado a vederlo senz'altro. Grandi saluti. Allora ci sentiamo dopo! Ciao! Sono d'accordo che Interstellar vada rivisto, comunque la prima reazione è stata rivedere 2001 e un vago senso di fastidio sul determinismo a chiudere il cerchio forzato dell'happy ending.